News headlines suggest that we’re in the middle of a hot “home buying season,” referring to the time of year — usually spring and early summer — when more people are on the hunt and prices respond accordingly. But there are other factors at play besides the time of year that are making people anxious to make real estate moves. First, the number of days that homes are spending on the market has recently hit a post-recession low, according to MarketWatch. Meanwhile, Freddie Mac reports that mortgage rates have recently climbed to their second highest level this year — this comes after the Federal Reserve voted to increase interest rates by 0.25% (and hints that more increases are on the horizon). And according to a recent Gallup poll, 64% of Americans believe that home prices in their local area will continue to rise. If you’ve been casually thinking about buying a home in the next few years, these trends might have you accelerating your plans — or maybe cancelling them altogether. But before you go down a real estate rabbit hole, it’s important to understand how much these external factors really matter, and what you should consider instead as your home buying plans take shape. There’s no doubt about it: home buying is seasonal. 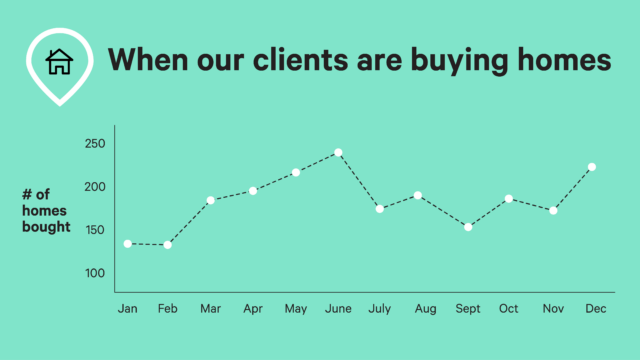 Looking at Wealthfront client data on number of new mortgages taken out each month, it’s clear that June and late November/early December see the most home buying activity. But it’s hard to say exactly what causes the variation in activity — good weather, holidays, and even the school calendar can be factors. Housing supply-and-demand is based on so much more than just seasonality. Residential construction rates in your city can play a big role in the number of homes on the market, according to Redfin, and so might be a better indicator of how competitive the buying market will be. At the end of the day, our perspective is that the best time of year to buy a home is whatever works best for your schedule and fits in with your overall financial goals. If you’re interested in seeing what’s realistic based on your finances and timeline to home ownership, you can use our Home Planning solution. We’ve said it before and we’ll say it again: timing the market is impossible. But what most people don’t realize is that this is absolutely true for the real estate market. Like the stock market, real estate volatility is hard to avoid, as evidenced by the Case-Shiller Home Price Indices. Just as home prices will go up, you can also count on them to come down. In the face of certain uncertainty, having a long-term time horizon and staying the course is your best path forward. Ensure you qualify for a mortgage with favorable terms by keeping your credit score up, keeping your debt-to-income (DTI) ratio low, and having enough saved up to make a healthy down payment. Learn more about what it really takes to qualify for a mortgage. Understand the “all in” costs of home ownership, including real estate agent fees, closing costs, home inspection, property taxes, insurance, maintenance, HOA fees, moving costs, and other immediate costs (some lenders require up-front cash for taxes). Learn more about the real costs of home ownership. Start investing your home savings. There are several ways to invest the funds you’ve set aside for a future home purchase. The right option depends on your time horizon. For near term purchases (within a year or two), it’s more prudent to stay out of the markets to avoid a potential downturn. For home purchases that are over 5 years away, we recommend investing your money in a long-term diversified investment portfolio, which can deliver higher returns than short-term savings options. Learn more about how you should invest your home savings. It’s easy to get caught up in the home buying hype, but ultimately buying your new home is a personal choice. Our Home Planning Guide covers all of these essentials and more. We break down what it actually means to buy (and sell) a home, what tradeoffs you might make with your purchase (like early retirement), and feature a comprehensive list of the costs and fees associated with home buying. Take it one step further with our Home Planning solution to explore how all the different choices (like when you buy or where you buy) can impact your overall finances.